This project is not a stitching project, but a project nonetheless. I bought these plastic balls at Canadian Tire last week when they marked down the prices on their Christmas decorations by 50%. They are strung on a wire clothes hanger that we unwound and roughly bent into a round shape. I really had no plan for stringing on the bulbs beyond I wanted a pretty wreath so there was some "string and remove" as I stepped back to see the colours and the fullness. A pair of pliers was used at the end to bend the hanger ends to make a clasp that is hidden under my fingers in this picture. 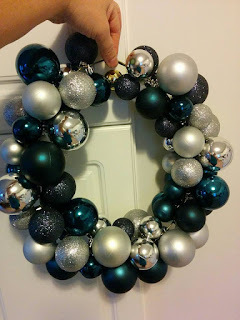 My plan is to hide the clasp under wire ribbon that I need to find at one of our local craft stores and perhaps weave some ribbon in and around the bulbs to cover any open areas where the wire can be seen. Sadly, I used up the only wire hanger I could find in this house so there may be no more attempts at other colours or combinations.